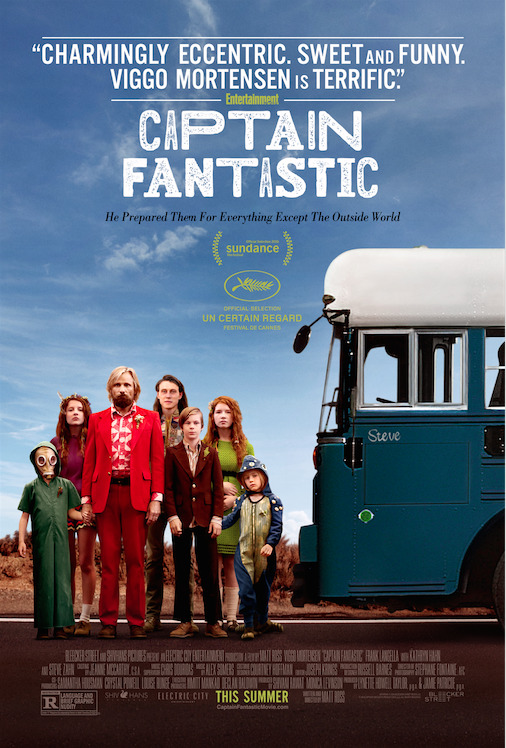 CAPTAIN FANTASTIC is a story about an unconventional family. The film is about a father and his 6 children, living in the forest. They hunt, are home schooled, wake up every morning to do what looks like a military boot camp, sit by the fire, sing etc. They receive knives as presents. You might wonder if they are in some sort of cult, but no, this is their family. The father wants to raise them to be physically strong as well as to be extremely intelligent. The mother isn’t present, but we soon find out the reason. Due to certain circumstances, they are forced to leave the forest and enter the “real world”. This makes them question their unconventional upbringing. The film makes you both angry and sympathetic. This film was both funny and sad. I laughed and I cried. It reminded me a bit of LITTLE MISS SUNSHINE, because of the quirky characters. The children, who were played by all unknown actors, were all so lovely. They were the core of the film.